As you may or may not already know I am an avid tea drinker. My tea of choice is a green tea and ginger mix but I do like to try out new tea every now and then. I recently discovered the Yogi brand of teas and it’s seeming becoming one of my favorites. I most especially love the way they flavor their tea and the aroma is quite pleasing. I have not had the need to add the usual honey for taste. My first purchase of the Yogi Brand of tea was for their Ginkgo Clarity Tea . The first thing I observed was the aroma followed by the flavor. I still drink the Ginko tea every once in a while. I am not sure if it has done much to boost my memory but it does help relax me. I recently ran out of my Green Tea and Ginger by so I went shopping for more. While perusing through the different brands of tea (I totally get confused by the many options out there), my eye caught the Yogi brand again. I looked through the options and eventually narrowed it down to Stress free or Detox. Seeing as I was in dere need of some Detox, I decided to try the Yogi DeTox Tea first. Let me first start with with the list of ingredients and what they supposedly do. The main herbs are Organic Burdock, Dandelion and Juniper Berry which known to be used for cleansing. It also has a “traditional Ayurvedic cleaning blend called Trikatu. Trikatu is a mix of Ginger, Black Pepper, and Long Pepper. It has the spicy flavor of Indian Sarsaparilla. Licorice, Cinnamon, Cardamom and Clove also add a spicy blend. The tea is caffeine free. I usually make two bags of the tea in one cup of boiled water. First thing I noted was the spicy taste. I am not sure if it was the Sarsaparilla or the Peppers that gave it that, but I’ll lean towards the peppers. It’s actually a really nice blend. I still prefer the general taste and aroma of the Gingo Clarity but the Detox is not far behind. I did not need to mix it with any other flavors unlike other brands I have tried. Does the Detox work? Well, I will say yes so this definitely is a good tea to try. If they decide to make an organic Green Tea and Ginger blend, chances are I may give that a shot. Currently I use the Simply Balanced Organic Green Tea Soothing Ginger blend and it has served me just fine. I started using it when I wanted to drop a few pounds. Coupled with a healthy diet and exercise, it worked wonders. Simply Balanced is the brand I have found so far with the exact mix of Green Tea and Ginger that I like. The only reason I would try another brand is because I usually need to add extra flavor like honey for taste and the aroma is just bleh. I will still try other teas from Yogi and when I do, I will write a review. I do recommend the Yogi DeTox Tea. I interchange between teas during the day and end up doing about 4 – 6 bags a day. I am trying to up that number to 8. 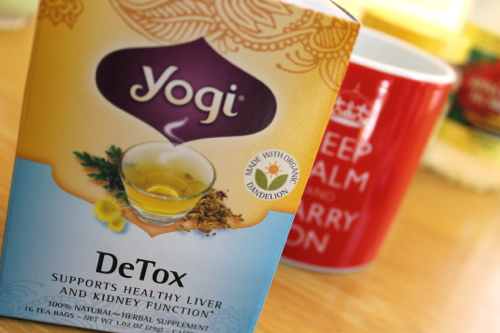 Keep in mind, the company states that Yogi DeTox Tea can be used everyday for up to 30 days. They recommend you take a 1 week break after the 30 days. After 30 days, I will switch to the Yogi Kava Stress Relief Tea or the Yogi Bedtime Tea . During one of my “let me just drink this one” days. there was another tea that I tried that helped me sleep like a baby. But for the life of me I can not remember which one it was. I will find some time to do a night time tea test and when I find out which one it was, I will definitely write about it because it is worth the try for those who find it hard to relax at night. I hope this helps and do feel free to share your tea experiences below. If there is a tea you think I should try, do let me know. Prev Mercedes Benz G63 AMG vs. Land Rover Range Rover Autobiography – Which SUV would you choose?